2002-02-28 Assigned to OBLIX, INC. reassignment OBLIX, INC. ASSIGNMENT OF ASSIGNORS INTEREST (SEE DOCUMENT FOR DETAILS). Assignors: VILLAVICENCIO, FRANCISCO J. The present invention pertains to a system for managing network access to resources that allows a first entity to impersonate a second entity. In one embodiment, the first entity can impersonate the second entity without knowing the second entity's password and/or without altering anything in the entity's set of personal information. This invention provides the first entity with the ability to troubleshoot in a live production system without disrupting the users or the system. In one embodiment, the first entity authenticates as itself. Access to resources is provided in response to an authorization process based on the identity of the entity being impersonated. This Application is related to U.S. patent application titled “Proxy System,” by Joan C. Teng and Chi-Cheng Lee, Attorney Docket Number OBLX-01025US0, filed on the same day as the present application, which is incorporated herein by reference. FIG. 16 is a flow chart describing a process for one embodiment of evaluating an authorization rule. FIG. 1 is a block diagram depicting one embodiment for deploying an Access System. FIG. 1 shows web browsers  12 and 14 accessing Web Server 18 and/or Web Server 20 via Internet (or other network) 16. In one embodiment, web browsers 12 and 14 are standard web browsers known in the art running on any suitable type of computer. FIG. 1 depicts web browsers 12 and 14 communicating with Web Server 24 and Web Server 20 using HTTP over the Internet; however, other protocols and networks can also be used. Web Server  18 is a standard Web Server known in the art and provides an end user with access to various resources via Internet 16. In one embodiment, there is a first firewall (see dotted lines) connected between Internet 16 and Web Server 18, a second firewall (see dotted lines) connected between the Web Servers and Access Server 34/Identity Server 400. FIG. 1 shows Web Gate  28, which is a plug-in to Web Server 18. Web Gate 28 communicates with Access Server 34. Access Server 34 communicates with Directory Server 36. The Access Management System includes Access Server  34, Web Gate 28, and Directory Server 36. Access Server 34 provides authentication, authorization, and auditing (logging) services. It further provides for identity profiles to be used across multiple domains and Web Servers from a single web-based authentication (sign-on). Web Gate 28 acts as an interface between Web Server 18 and Access Server 34. Web Gate 28 intercepts requests for resources, and authorizes them via Access Server 34. Access Server 34 is able to provide centralized authentication, authorization, and auditing services for resources hosted on or available to Web Server 18 and other Web Servers. The Identity Management System includes Web Pass  38, Identity Server 40 and Directory Server 36. Identity Server 40 manages identity profiles. An identity profile is a set of information associated with a particular entity (e.g. user, group, organization, etc.). The data elements of the identity profile are called attributes. An attribute may include a name, value and access criteria. The Identity Server includes three main applications, which effectively handle the identity profiles and privileges of the user population: User Manager 42, Group Manager 44, and Organization Manager 46. User Manager 42 manages the identity profiles for individual users. Group Manager 44 manages identity profiles for groups. Organization Manager 46 manages identity profiles for entire organizations. Using the multi-step workflow engine, a company can tailor the functionality of each of these applications to its own operating processes. Having flexible administrative workflows for every step in user, group and organization management not only lowers e-business transaction costs, it also ensures consistent services and tight security across the entire distributed environment. Identity Server  40 also includes Publisher 48, which is an application, which enables entities to quickly locate and graphically view information stored in an LDAP directory (or other data store). The Identity Management System's functionality is processed by Identity Server  40, which communicates with WebPass 38. In one embodiment, Web Pass 38 is a web server plug-in that sends information back and forth between Identity Server 40 and Web Server 20. The system also provides a Certificate Processing Server (not shown in FIG. 1) for managing digital certificates. User Manager  42 handles the key functions related to user identities and access privileges, including creation and deletion of user identity profiles, modification of user identity profile data, determination of access privileges, and credentials management of both passwords and digital certificates. With User Manager 42, the create, delete, and modify functions of user identity management can be set as flexible, multi-step workflows. Each business can customize its own approval, setup, and management processes without restriction and have multiple processes for different kinds of users. Group Manager  44 allows entities to identify groups of users who need identical access privileges to a specific resource or set of resources. Managing and controlling privileges for a group of related people—rather than handling their needs individually—yield valuable economies of scale. Group Manager 44 meets a wide range of e-business needs: easy creation, maintenance, and deletion of permanent and ad hoc groups of users who may be allowed or denied access to particular resources; modification and adaptation of groups and their access privileges with minimal disruption to the directory server's underlying schema; efficient addition and deletion of users from established groups; and delegation of administrative responsibility for group membership and subscription requests and approvals. With Group Manager 44, companies can allow individual users to self-subscribe to and unsubscribe from groups, see the groups that they are eligible to join or have joined, and request subscription to groups that have access to the applications they need. Multi-step workflows can then define which users must obtain approval before being added to a group and which can be added instantly. Group Manager 44 also lets companies form dynamic groups specified by an LDAP filter. The third application in the Identity System, Organization Manager  46, streamlines the management of large numbers of organizations within an e-business network—partners, suppliers, or even major internal organizations such as sales offices and business units. Certain infrastructure security and management operations are best handled—or can only be handled—at the highest organizational unit (OU) level rather than at the individual or group level. Like User Manager and Group Manager, this application relies on multi-step workflow and delegation capabilities. With the system of FIG. 1 deployed, Web Server  18 (enabled by Web Gate 28, Access Server 34, and Directory Server 36) can make informed decisions based on default and/or specific rules about whether to return requested resources to an end user. The rules are evaluated based on the end user's identity profile, which is managed by the Identity System. In one embodiment of the present invention, the general method proceeds as follows. An end user enters a URL or an identification of a requested resource residing in a protected policy domain. The user's browser sends the URL as part of an HTTP request to Web Server 18. Web Gate 28 intercepts the request. If the end user has not already been authenticated, Web Gate 28 causes Web Server 18 to issue a challenge to the browser for log-on information. 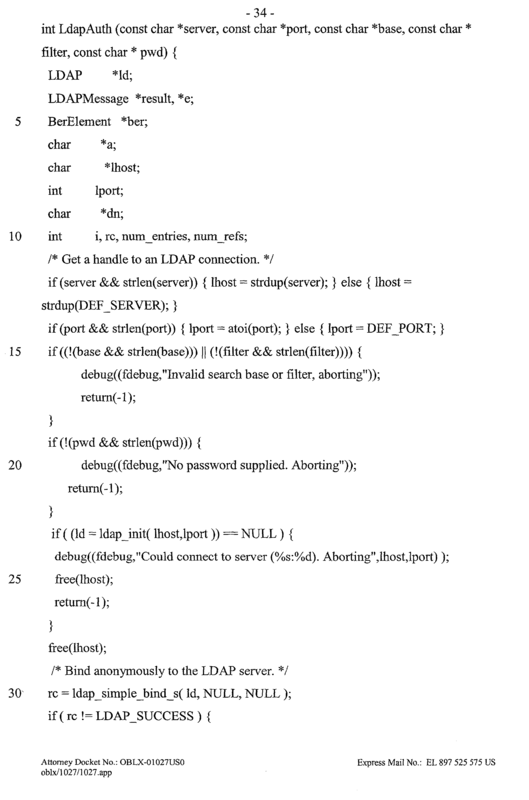 The received log-on information is then passed back to Web Server 18 and on to Web Gate 28. Web Gate 28 in turn makes an authentication request to Access Server 34, which determines whether the user's supplied log-on information is authentic or not. Access Server 34 performs the authentication by accessing attributes of the user's identity profile and the resource's authentication criteria stored on Directory Server 36. If the user's supplied log-on information satisfies the authentication criteria, the process flows as described below; otherwise, the end user is notified that access to the requested resource is denied and the process halts. After authenticating the user, Web Gate 28 queries Access Server 34 about whether the user is authorized to access the resource requested. Access Server 34 in turn queries Directory Server 36 for the appropriate authorization criteria for the requested resource. Access Server 34 retrieves the authorization criteria for the resource and, based on that authorization criteria, Access Server 34 answers Web Gate 28's authorization query. If the user is authorized, the user is granted access to the resource; otherwise, the user's request is denied. Various alternatives to the above described flow are also within the spirit and scope of the present invention. The system of FIG. 1 is scalable in that there can be many Web Servers, many Access Servers, and many Identity Servers. In one embodiment, Directory Server  36 is an LDAP Directory Server and communicates with other servers/modules using LDAP over SSL. In other embodiments, Directory Server 36 can implement other protocols or can be other types of data repositories (e.g. SQL, etc.). FIG. 1 shows Identity Server 40 communicating with directory server 36. The system can also support multiple directory servers (or other types of data stores). FIG. 2 depicts an exemplar directory tree that can be stored on Directory Server  36. Each node on the tree is an entry in the directory structure that includes an identity profile. In one embodiment, the entity can be a user, group or organization. Node 230 is the highest node on the tree and represents an entity responsible for the directory structure. In one example, an entity may set up an Extranet and grant Extranet access to many different companies. The entity setting up the Extranet is node 230. Each of the companies with Extranet access would have a node at a level below node 230. For example, company A (node 232) and company B (node 234) are directly below node 230. Each company may be broken up into organizations. The organizations could be departments in the company or logical groups to help manage the users. For example, FIG. 2 shows company A broken up into two organizations: organization A with node 236 and organization B with node 238. Company B is shown to be broken up into two organizations: organization C with node 240 and organization D with node 242. FIG. 2 shows organization A having two end users: employee 1 with node 250 and employee 2 with node 252. Organization B is shown with two end users: employee 3 with node 254 and employee 4 with node 256. Organization C is shown with two end users: employee 5 with node 258 and employee 6 with node 260. Organization D is shown with two end users: employee 7 with node 262 and employee 8 with node 264. FIG. 3 is a flow chart, which describes the process of creating a policy domain. In step  600, a request is received to create a policy domain. In step 602, the name of the policy domain and the description of the policy name are stored. In step 604, one or more URL prefixes are added to the policy domain. In step 605, one or more host ID's are added to the policy domain (optional). Next, one or more access rules are added to the policy domain. An access rule is a rule about accessing a resource. Examples of access rules include authorization rules, authentication rules, auditing rules, and other rules which are used during the process, or attempting to access a resource. In step 606, a first level (default) authentication rule is added to the policy domain. In general, authentication is the process of verifying the identity of the user. Authentication rules specify the challenge method by which end users requesting access to a resource in the policy domain must prove their identity (authentication). As previously discussed, first level (default) authentication rules apply to all resources in a policy domain, while second level authentication rules are associated with policies that apply to subsets of resources or specific resources in the policy domain. In one embodiment, there is only one default authentication rule for a policy domain. If an administrator desires an authentication rule to apply to only a specific resource in the policy domain, a separate policy for that specific resource having a second level (specific) authentication rule should be defined, as discussed below. After setting up the authentication rule in step 606, one or more first level or default authorization rules are added to the policy domain in step 608. In general, an authorization rule determines who can access a resource. The default authorization rule allows or denies users access to resources within its applicable policy domain. If multiple authorization rules are created, then they are evaluated in an order specified in step 610. In step 612, a first level (default) audit rule is configured for the policy domain. In step 614, zero or more policies are added to the policy domain. In step 616, the data for the policy domain is stored in Directory Server 36 and appropriate caches (optional) are updated. In one embodiment, an authorization rule or an authentication rule can be set up to always grant authentication without any challenge or verification or always grant authorization without any verification. FIG. 4 is a flow chart describing the process of adding one or more authorization rules to a policy domain. In step  632, timing conditions are set up for the authorization rule. Timing conditions restrict the time when the authorization rule is in effect. For example, users can be allowed access to URLs in the policy domain only during business hours, Monday through Friday. In one embodiment, if timing conditions are not set, the authorization rule is always in effect. In steps 634 and 636, authorization actions are set up. Authorization actions personalize the end user's interaction with the Web Server. In step 634, header variables are provided for authorization success events and authorization failure events. This feature allows for the passing of header variables about the end user (or other information) to other web-enabled resources. Web-enabled applications can personalize the end user's interaction with the Web Server using these header variables. As a simple example, the actions could supply each application with the user's name. An application could then greet the user with the message “hello <user's name>” whenever the user logs on. Header variables are variables that are part of an HTTP request. If an authorization rule is set up with header variables as part of an authorization success action, then when a successful authorization occurs the HTTP request to the resource will include the header variables. FIG. 5 is a flow chart that describes the process of adding header variables to an HTTP request. Header variables can be added during an authorization success event, authorization failure event, authentication success event or authentication failure event. In step  650, the variable name is entered. In step 652, a text string is entered. In step 654, one or more LDAP attributes are identified. In step 656, it is determined whether any more header variables will be added. If not, the method of FIG. 5 is done (step 658). If so, the method of FIG. 5 loops back to step 650. The variable name entered in step  650 is a value that appears in the HTTP header that names the variable. The downstream resource using the header variable will search for the variable name. The string entered is data that can be used by the downstream resource. The LDAP attribute(s) can be one or more attributes from the requesting user's identity profile. Thus, in the simple authorization success example described above, the variable name field can include “authorization success,” the return field can include “yes,” and the attribute field can include the name attribute for the user in the user's identity profile. Any of the attributes from the user's identity profile can be selected as a header variable. Looking back at FIG. 4, in step  636, a redirect URL can be added for an authorization success event and a redirect URL can be entered for an authorization failure event. Step 638 includes specifying which users are allowed to access the resource associated with the authorization rule. By default, users cannot access a resource until they are granted access rights to it. In one embodiment, there are at least four means for specifying who can access a resource. The first means is to explicitly name a set of users who can access the resource. A second means includes identifying user roles. The third means is to enter an LDAP rule that can be used to identify a set of users based on a combination of one or more attributes. A fourth means is to enter an IP address, which will allow users of computers having the specified IP address to access the resource. Step 640 is used to specify the users not allowed to access the resource associated with this rule. Identification of users, roles, LDAP rules, and IP addresses are entered in step 640 in the same manner as entered in step 638. It is possible that a particular user can be subject to both an allow access rule and a deny access rule. Step 642 is used to set a priority between such rules. Optional step 644 is used to define any POST data to be used for authorization if this feature is implemented. An HTTP POST request can include POST data in the body of the HTTP request. POST data can also be submitted in query string form. In optional step 644, an administrator defines which (if any) POST data is to be used for authorization purposes. Step 646 is used to set a priority of evaluation for the authorization rule relative to other authorization rules in a given policy. In one embodiment, if multiple authorization rules apply to a resource, this priority determines the order of evaluation. FIG. 6 is a flow chart describing the process for adding an authentication rule. In step  670, a challenge scheme (also called an authentication scheme) is selected. An authentication scheme is a method for requesting log-on information (e.g. ID and password) from end users trying to access a web resource. 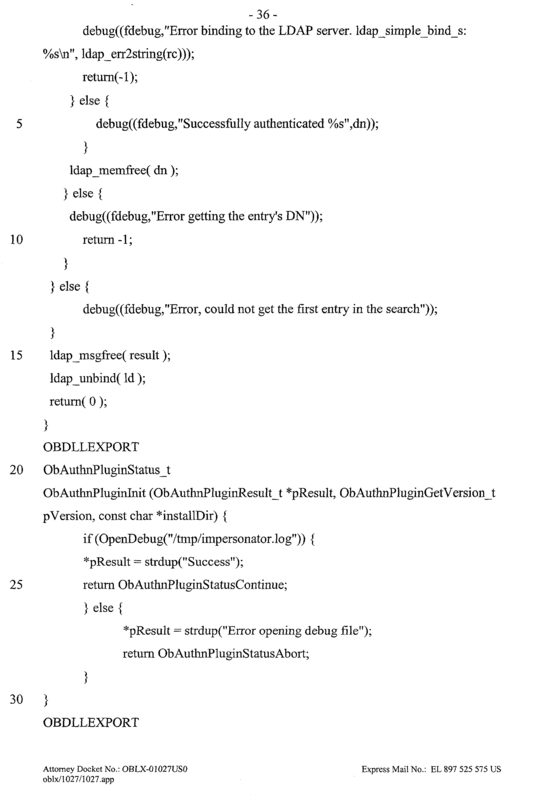 Within an authentication scheme is a challenge method (e.g. Basic, certificate or form). There can be more than one authentication scheme with the same challenge method (e.g. Basic over LDAP, Basic over NT Domain, . . . ). Various other authentication schemes can also be used. In step 672, header variables are added for authentication success and authentication failure events. In step 674, redirect URLs are added for authentication success events and authentication failure events. “HTTP://www.zoo.com/animals.cgi?uid=maneaters&tigers=2” the values after the question mark (e.g. “uid=maneaters&tigers=2”) comprise a query string. Only a URL exhibiting the query string can match to this policy. For example, a URL with the “tigers” variable appearing before the “uid” variable will not match the above-identified policy. In step  726, query string variables are added. 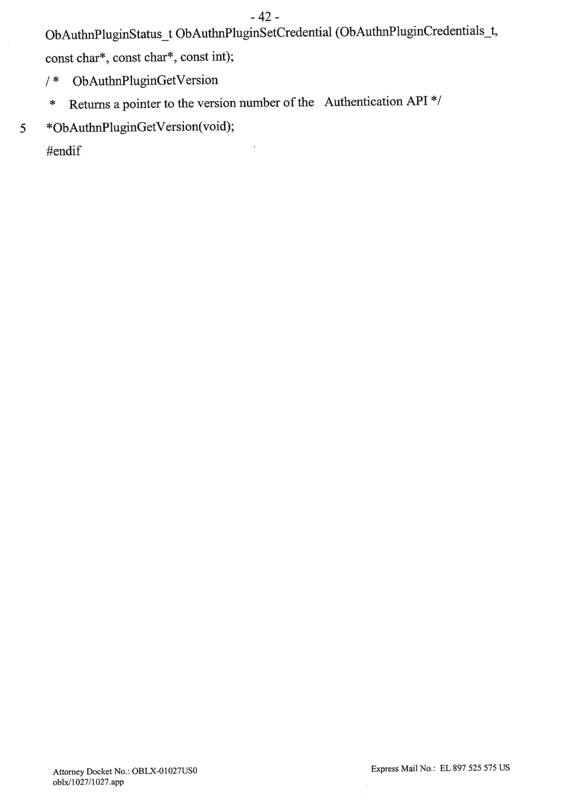 Query string variables include a name of a variable and the variable's corresponding value. Query string variables are used when it is a desirable that multiple variables are found in the query string, but the order is unimportant. Thus, for a policy with query string variables “uid=maneaters” and “tigers=2,” a URL with a query string having the appropriate uid and appropriate tigers variable, in any order, will match the policy. In order for a resource URL to apply to a policy, the path of the requested resource URL must match the path of the policy as well as any query string or query variables. As discussed above, POST data can be submitted in query string form (for example, in a form submission), and evaluated using the query string variables entered in step 726. The query string or query variables do not need to uniquely identify a resource. Rather, they are used to identify a policy, which may apply to one or more resources. In step  728 of FIG. 7, an authentication rule is created. In step 730, one or more authorization rules are created for the policy. In step 732, an audit rule is configured for the policy. In step 734, POST data (optional) is added to the policy. This POST data is used to map resources with policies. FIG. 8 provides a flow chart for one embodiment of a method for authenticating, authorizing, and logging. In step  750, a user's browser 12 requests a web-enabled resource 22 or 24. The request is intercepted by Web Gate 28 in step 752. The method then determines whether the requested resource is protected by an authentication and/or authorization rule in step 753. If the resource is not protected, then access is granted to the requested resource in step 795. If the requested resource is protected (e.g. the URL maps to a policy domain), then the method proceeds to step 754. If the user has previously authenticated for a protected resource in the same domain, a valid authentication cookie will be passed by browser 12 with the request in step 750 and intercepted by Web Gate in step 752. If a valid cookie is received (step 754), the method attempts to authorize the user in step 756. If no valid authorization cookie is received (step 754), then the method attempts to authenticate the user for the requested resource (step 760). If the user successfully authenticates for the requested resource (step  762), then the method proceeds to step 774. Otherwise, the unsuccessful authentication is logged in step 764. After step 764, the system then performs authentication failure actions and Web Gate 28 denies the user access to the requested resource in step 766. In step 774, the successful authentication of the user for the resource is logged. The method then performs authentication success actions in step 766. In step 778, an authentication cookie is created. In one embodiment, the cookie includes the distinguished name of the authenticated user received from the authentication process. In the instance where user A is trying to impersonate user B, the distinguished name (or other identification) for user B will be stored in the cookie. Web Gate 28 then passes a valid authentication cookie to browser 12 in step 780, which is stored by browser 12. After passing the cookie in step 780, the system attempts to authorize in step 756. In step  756, the method attempts to determine whether the user is authorized to access the requested resource. In many cases, authorization is performed based on the identity profile associated with the distinguished name stored in the authentication cookie. Therefore, when impersonating, authorization is based on the identity profile of the user being impersonated, not on the basis of the identity profile of the user doing the impersonation. If the user is authorized (step 790), the method proceeds to step 792. Otherwise, the unsuccessful authorization is logged in step 796. After step 796, the method performs authorization failure actions (step 798) and Web Gate 28 denies the user access to the requested resource. If authorization is successful (step 790), then the successful authorization of the user is logged in step 792, authorization success actions are performed in step 794, and the user is granted access to the requested resource in step 795. If user A is impersonating user B, then in step 795, user A is granted access to the resource as user B. That is, the Access System and the resource treat the user as user B and use user B's identity profile. In one embodiment of step 795, some or all of the HTTP request information is provided to the resource. In step  1020 of FIG. 9, the system determines whether single or multiple domains are protected in a given deployment of the present invention. If only a single domain is protected, then the method proceeds to step 1022 where an authentication is attempted at the single domain. If the single domain is distributed across multiple Web Servers, then the domain attribute of the cookie set by the authenticating Web Server in step 1022 is set to broadly include all Web Servers in the domain. If multiple domains are protected, the method proceeds to step  1024 determines whether the multiple protected domains all reside on a single Web Server. For example, a single machine intranet.oblix.com may be addressed in multiple ways such as: sifi.oblix.com, intranet, asterix.oblix.com, or 192.168.70.1. In accordance with the present invention, when multiple domains reside on a single Web Server, an administrator will designate exactly one of the domains a “preferred host domain.” If step 1024 indicates that all protected domains reside on the same Web Server, then the system determines whether the domain of the requested resource is a preferred host (step 1026). If it is a preferred host, then the system attempts to authenticate the user at the preferred host domain in step 1030. Otherwise, browser 12 is re-directed to the preferred host domain (step 1028) for authentication (step 1030). Referring to step 1024, if the multiple protected domains reside on multiple Web Servers, then the method proceeds to step 1032. FIG. 10 provides a block diagram of a plurality of Web Servers, each hosting a different domain accessible by browser  1082. In accordance with the present invention, when multiple domains are protected and distributed across multiple Web Servers, the administrator will identify exactly one of the domains a “master domain.” As identified in FIG. 10, Web Server 1070 hosts master domain A.com, while Web Servers 1072 and 1074 host domains B.com and C.com, respectfully. An end user's resource request is illustrated in FIG. 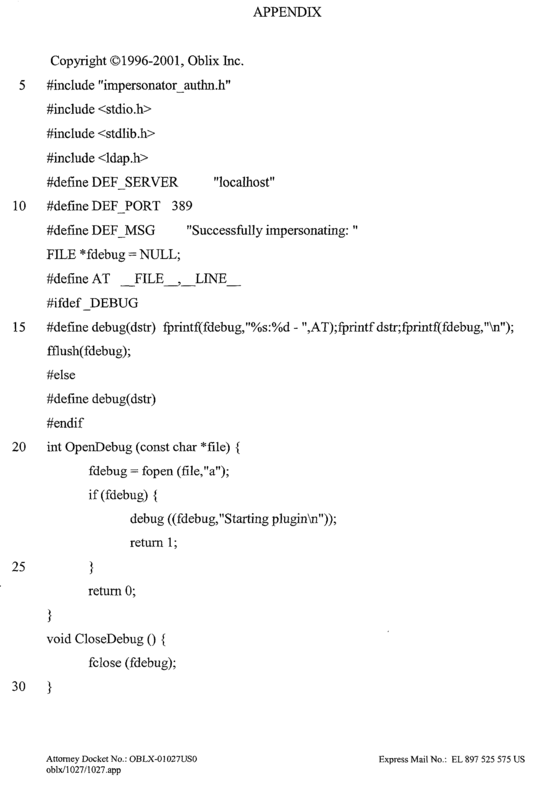 29 by path 1084 from browser 1082 to Web Server 1072. Referring back to FIG. 9, if it is determined that the domain of the requested resource is a master domain (step  1032), then the system attempts to authenticate at the master domain (step 1034). Otherwise, Web Gate redirects browser 1082 to the master domain (step 1036). The user then authenticates at the master domain (step 1038). The redirection and authentication of steps 1036 and 1038 are illustrated in FIG. 10 by path 1086. Upon a successful authentication at the master domain, the master domain Web Server passes an authentication cookie to the user's browser (step 1040) and re-directs the user's browser back to the first domain accessed by the user (step 1042). Also in step 1042, the master domain passes information contained in the master domain authentication cookie to the first domain in the query data portion of the redirection URL. Steps 1040 and 1042 are illustrated by paths 1088 and 1090, respectively in FIG. 10. In step 1044, the Web Gate of the first domain Web Server extracts the master domain authentication cookie information from the redirection URL, thus confirming the user's authentication at the master domain and resulting in a successful authentication (step 1046). The first domain Web Server (B.com) then sends its own authentication cookie to web browser 1082 (as depicted by path 1092). Any subsequent authentication by browser 1082 at domain C.com on Web Server 1074 follows the method of FIG. 9. FIG. 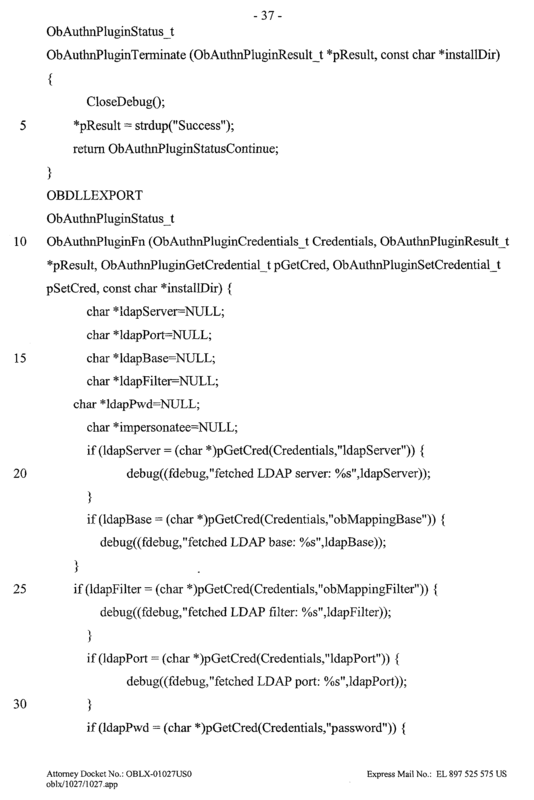 11 provides a flow chart of the method for authenticating, as performed in steps  1022, 1030, 1034, and 1038 of FIG. 9. In step 1120, the system accesses the authentication challenge method that is to be used for the given resource. This challenge method is stored in the directory, and can also be stored in a cache. In step 1126, the system discerns whether the authentication challenge scheme calls for basic, form, certificate, or no authentication. If the challenge scheme indicates basic authentication, then the method proceeds to step 1128 and performs basic authentication. If the challenge scheme indicates form authentication, then the method proceeds to step 1130 and performs form authentication. If the challenge scheme indicates certificate authentication, then the method proceeds to step 1132 and performs certificate authentication. If the challenge scheme indicates that no authentication is required (step 1134), then the user is not challenged, authentication is not performed. FIG. 12 provides a flow chart describing a method for performing form authentication. Form authentication includes a user being presented with a form (e.g. graphical) so that the user can provide authentication credentials and other information. In one embodiment, authentication credentials include an ID (also called a user name) and password. In other embodiments, authentication credentials can include other information to be used to authenticate. The user will also be provided with a field to enter an ID for a user to be impersonated. If the user does not enter an ID for a user to be impersonated, the user will be logged in as itself. If user A provides an ID for user B (to impersonate user B), then user A will impersonate user B as described herein. In step  1308, the system sets a “form login” cookie on browser 12. The cookie includes the URL of the requested resource. Browser 12 is then redirected to an authentication form URL (step 1310). In step 1312, Web Gate 28 allows the authentication form referenced by the authentication form URL to pass to browser 12. In step 1314, the user fills out the authentication form (e.g. ID, PW, impersonate ID) and transmits the information from the authentication form (step 1316), passing the form login cookie previously set in step 1308. Web Gate 28 then extracts the URL of the requested resource from the form login cookie (step 1318), and passes the user ID, password, and impersonate ID provided by the user in the authentication form (submitted as POST data) to Access Server 34 (step 1320). In step  1322, the Access Server authenticates the user for the requested resource using the user's ID and password received from Web Gate 28. In step 1324, Access Server 34 sends a request to Directory Server 36 to find the identity profile having a user ID attribute that matches the ID provided for the user to be impersonated. Directory Server 36 finds the identity profile, which has as an attribute ID for the user to be impersonated. In step 1326, Access Server 34 is provided with the attributes of the identity profile for the person to be impersonated. In various embodiments, different ones of those attributes are used. In one embodiment, Access Server 34 uses the distinguished name (DN). In other embodiments, other attributes are provided. In step 1328, Access Server 34 returns the authentication result. If the result is a successful authentication (and in some embodiments, even if it is not), the Access Server returns (and, possibly carries out) the authentication actions, the DN for the person to be impersonated (based on the identity profile from step 1324 and 1326) and other attributes of interest (depending on embodiment) to Web Gate 28. In step 1330, Web Gate 28 sets the form login cookie to “done.” Web Gate 28 will store the DN for the person to be impersonated in the cookie created in step 778 of FIG. 8. Note that if there is no impersonation, then steps 1324 and 1326 are not performed and, in step 1382, Access Server 34 returns the DN for the entity that was authenticated. FIG. 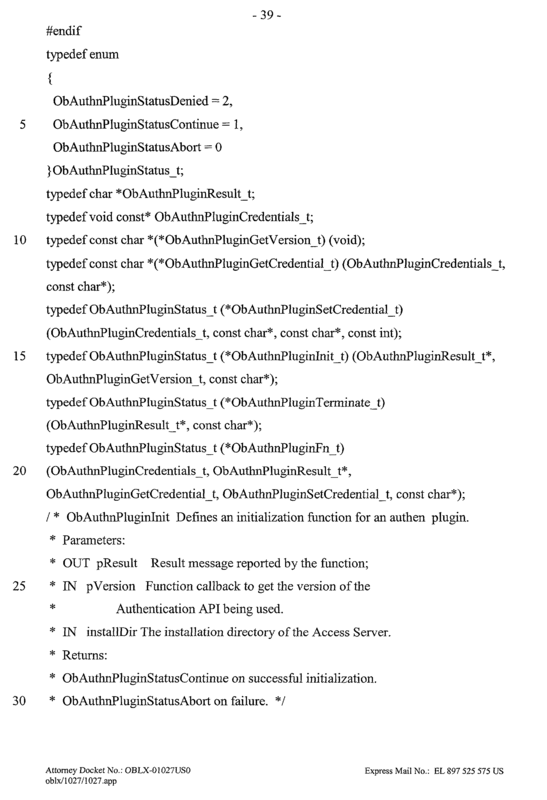 13 provides a flow chart describing an exemplar method used by the Access Server to authenticate using a user ID and password (step  1322 of FIG. 12). In step 1400, the system verifies the search base. In some embodiments, the process of authentication is performed by a plug-in or other process. This process can be provided with a search base, which identifies a portion of the directory tree to search within in order to find the profile of the entity being authenticated. Step 1400 includes verifying that an appropriate search base was provided and that the search base provided exists in the directory tree. In other embodiments of step 1400, the system only verify that a search base was provided. In step 1402, the system will verify that an identification and password were provided for the entity being authenticated. In step 1408, the accesses will request a search of user identity profiles in Directory Server 36 for a user identity profile having a user ID attribute matching the user ID received from Web Gate 28. If no matching user identity profile attribute is found in Directory Server 36 (step 1410), the method proceeds to step 1412 and the authentication result is reported as being not successful. If a matching user identity profile is found, then the Access System attempts to bind to that user identity profile in step 1414. That is, Access Server 34 provides the password to Directory Server 36. The Directory Server verifies that the user supplied password matches the password in the identity profile. In other embodiments, other attributes can also be verified against data supplied from a login page or other source. If the bind was successful (e.g. the password matches) (step 1416), then the authentication was successful and reported as such in step 1418. If the bind was unsuccessful (step 1416), then authentication failed and is reported as being not successful in step 1412. In an alternative embodiment, after determining that the bind was successful, the system may determine whether the user being authenticated is on a revoked user list. If the user is on the revoked user list, then authentication fails. When authentication is successful, one embodiment includes retrieving all the attributes from the user's identity profile and storing them in a cache (or elsewhere) for later use with authorization. FIG. 14 provides a block diagram of an authentication cookie  1450 passed by Web Gate 28 to browser 12. Cookie 1450 is encrypted with a symmetric cipher so that cookies from all instances of Web Gate 28 in a given deployment of the present invention may be encrypted using the same key. This key (shared secret) is stored on Directory Server 36 and distributed to each of the Web Gates 28 by Access Server 34. The shared secret can change as often as desired by an administrator. In one embodiment of the present invention, cookie 1450 is encrypted using RC4 encryption with a 2048 bit key. In one embodiment, previously valid keys are grand fathered such that both the current key and the immediately prior key will both work to de-crypt encrypted cookie 1450. The present invention features a one-button key re-generation function. In one embodiment, the information stored by cookie  1450 includes the authentication level 1452 of the authentication scheme used to create the cookie, distinguished name (DN) 1454, the IP address 1456 of the authenticated user, and session start time 1458 identifying the time at which cookie 1450 was created. If the time elapsed since the session start time 1458 exceeds a maximum session time, the cookie will become invalid. Idle start time 1460 is also stored, which identifies the time when the previous HTTP request for a protected resource was made in which cookie 1450 was passed. If the time elapsed since the idle start time 1460 exceeds a maximum idle time, the cookie will become invalid. Both of these time limits force users to re-authenticate if they have left a session unattended for longer than the maximum session or idle times. Cookie 1450 also stores a secured hash 1462 of information 1452, 1454, 1456, 1458, and 1460. In one embodiment of the present invention, secured hash 1462 is created using an MD5 hashing algorithm. When user A is impersonating user B, the distinguished name stored in DN field 1454 of cookie 1450 is the distinguished name of user B which was accessed in step 1326 of FIG. 12. If there is no impersonation, then DN field 1454 stores the distinguished name of the user who was authenticated. Other embodiments store a different type of name or identification, rather than a distinguished name. The process of authorizing (step  756 of FIG. 8) includes evaluating a set of authorization rules against attributes and/or other data. FIG. 15 is a flow chart describing one embodiment of the process for authorizing. In step 1520, the system will access the distinguished name (or other name) from the cookie. If user A is impersonating user B, then the distinguished name accessed is for user B. Thus, the Access Management System will be treating user A as if it were user B trying to be authorized. Any header variables sent to the resources will also be based on user B attributes. If user A is not trying to impersonate, then the distinguished name accessed is that of user A. In step 1524, attributes from the identity profile associated with the distinguished name of step 1520 are accessed. Thus, if user A is impersonating user B, then the attributes for user B's identity profile are accessed. In step 1526, the appropriate authorization rule(s) is accessed based on a match of the resource to a policy domain or policy. Note that attributes and rules can be cached. In step 1528, the authorization rule(s) is applied to the attributes and/or other data. FIG. 16 provides a flow chart describing the method of applying an authorization rule. In one embodiment, authorization can be performed using POST data. In another embodiment, POST data is not used for authorization. If POST data is to be used for authorization, then the method of FIG. 16 begins with step  1620. Otherwise, the method begins at step 1624. In step 1620, if the resource request employs a POST request method, then authorization module 542 proceeds to step 1622 where it applies the authorization rule to the POST data. If the resource request does not employ a POST request method (or if POST data is not enabled to be used for authorization), then the method proceeds to step 1624. If specific users are defined (by distinguished name) in the authorization rule, the system evaluates whether the distinguished name from the cookie (e.g. impersonates) matches the distinguished name called for by the authorization rule (step 1626). If specific groups are defined in the authorization rule (step 1628), then the system evaluates whether the distinguished name (e.g. impersonatee) from the cookie is a member of the group called for by the authorization rule (step 1630). In one embodiment, the user's group membership is cached. If specific roles are defined in the authorization rule (step 1632), then the method evaluates whether the entity associated with the distinguished name from the cookie (e.g. impersonates) matches the role called for by the authorization rule (step 1634). If specific LDAP rules are defined in the authorization rule (step 1640), the system evaluates whether the attributes of the identity profile for the distinguished name from the cookie (e.g. impersonates) match the LDAP rule called for by the authorization rule (step 1642). If specific IP addresses are defined in the authorization rule (step 1644), then the system evaluates whether the IP address of the authenticated user matches the IP addresses called for by the authorization rule (step 1646). If a successful match is found at any point (steps 1627, 1631, 1635, 1643, and 1647), then the authorization is successful (step 1650). In another embodiment, multiple matches must be found before an authorization is deemed successful. For example, a user may need to satisfy an LDAP filter and have a certain IP address in order be authorized. If no matches are found, authorization is unsuccessful (step 1652). In one embodiment of the present invention, an authentication scheme is created by defining eight sets of parameters. The first parameter is the name of the authentication scheme. The second parameter is a description of the authentication scheme. The third parameter is the level. That is, authentication schemes can be at different levels to identify which schemes are more stringent than others. The fourth parameter identifies the challenge method (e.g. basic, form, certificate, etc.). The fifth parameter identifies challenge parameters. For example, challenge parameters can include a user ID, password, ID for the impersonatee, etc. The sixth parameter indicates whether SSL is required. The seventh parameter includes a redirect URL which can be used to redirect the user after authentication is successful, after authentication has failed or prior to authentication. The eighth parameter identifies a set of plug-ins. In one embodiment, the processes for using the authentication challenge parameters (e.g. the authentication credentials) are performed by a set of plug-ins. For example, the processes of FIGS. 12 and 13 can be performed by plug-ins. In one embodiment, the process of FIG. 13 is performed by a first plug-in and the process of steps  1322-1326 (or just step 1328) are performed by a second plug-in. 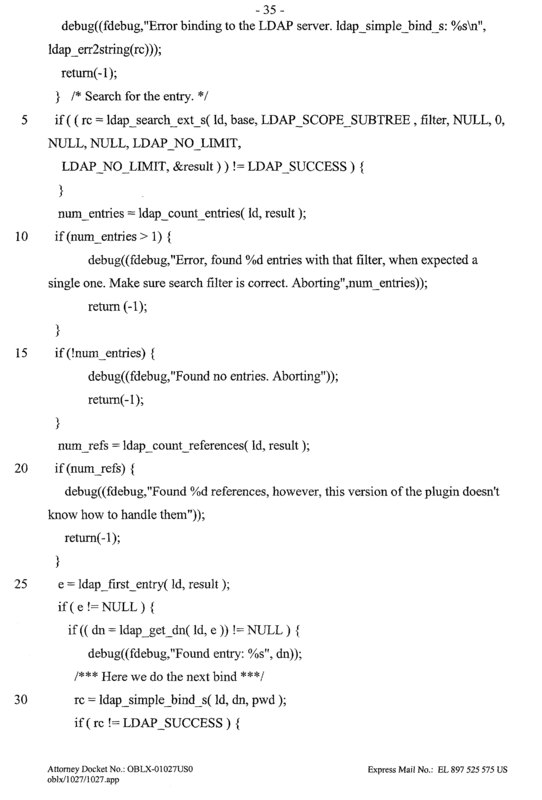 Source code for a sample plug-in is provided in the Appendix below. Some embodiments do not use plug-ins. Rather, the functionality is built-in. authorizing said first entity to access a first resource as said second entity based on said cookie. providing a form for said authentication credentials, said form includes a request for a user identification, a password and an impersonatee identification, said user identification and said password correspond to said authentication credentials for said first entity, said impersonatee identification corresponds to said identification of said second entity. said first resource is separate from said access system. said plurality of resources includes said first resource. said cookie stores a distinguished name of said second entity and an IP address for said first entity. transmitting said cookie for storage on a device being used by said first entity to send said request to access said first resource. said first resource is protected by, but separate from, said access system. said cookie includes said one or more attributes of said second user identity profile. said steps of searching said directory server for a second user identity profile and accessing one or more attributes of said second user identity profile are performed by a second authentication plug-in. comparing attributes of said user identity profile for said second entity to said set of one or more authorization rules for said first resource. 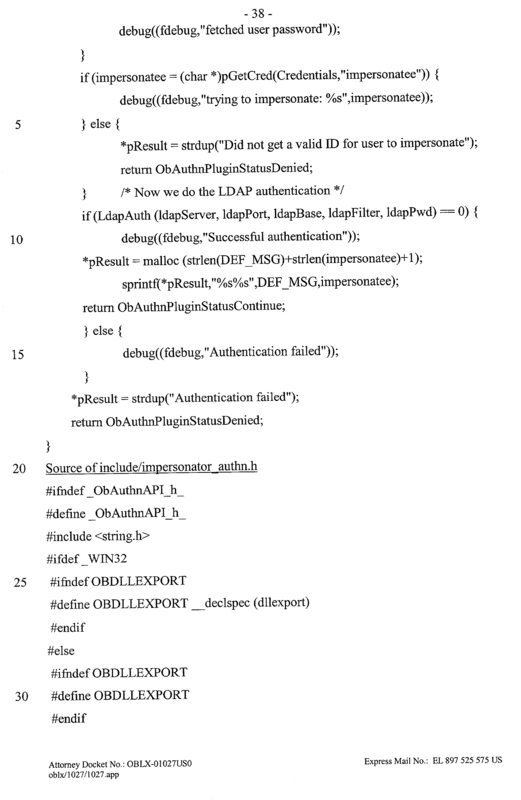 said step of authorizing is based on one or more of said attributes for said second entity. said step of authorizing is not based on attributes for said first entity. providing said login form, said login form includes a request for a user identification, a password and an impersonatee identification, said user identification and said password correspond to said authentication credentials for said first entity, said impersonatee identification corresponds to said identification of said second entity. authorizing said first entity to access said second resource as said second entity based on said cookie, said step of authorizing said first entity to access said second resource is performed without authenticating said first entity in response to said request to access said second resource. said steps of authenticating and authorizing are performed without knowing a password for said second entity. authorizing said first entity to access said first resource as said second entity, said step of authorizing is performed by said access system. said step of authorizing uses said one or more attributes of said second user identity profile. comparing attributes of said user identity profile for said second entity to said set of one or more authorization rules for said resource. authorizing said first entity to access said second resource as said second entity, said step of authorizing said first entity to access said second resource is performed without authenticating said first entity in response to said request to access said second resource. authorizing said first entity to access said one or more of said plurality of resources as said second user, said step of authorizing is performed by said access system. comparing attributes of said user identity profile for said second entity to said set of one or more authorization rules.